In an attempt to prove that I’m the coolest member of the crew, I’ll be attempting the impossible: live blog the Xbox E3 Media Briefing, happening at 9:30am to 11:30am (?) this morning. I’ll be summarizing all the announcements in this article as the event goes on. The page is set to refresh every 30 seconds, so you don’t have to worry about any of that, and all of the newest updates will show on top… if I can keep up with the pace. But for the time being, grab a popcorn, follow our coverage, and enjoy the show! 11:05AM – Exclusive on Xbox One, Spring 2014. 11:04AM – Ok, that last part was pretty cool. Everyone is ecstatic and applauding like crazy. 11:02AM – Oh, so THAT’S why it’s called TitanFall! Falling Titans, like big things, like robots! Get it? 11:01AM – It’s odd.. it’s definitely a multiplayer game. There’s scores up top and a “X person joined” that showed up on the lower right corner of the screen. 11:01AM – It’s Call of Duty, but with robots! And it looks fantastic! 11:00AM – Xbox Live Cloud Computer. Ohhh, and a live demo! 10:59AM – There’s Vince Zampella. 10:57AM – Here’s TitanFall! And Troy Baker! 10:56AM – November folks. The war starts in November. 10:55AM – Xbox One, November, $499, 429 Euros in UK. 10:54AM – There’s that cloud computing again. Oh, and 60fps. 10:52AM – CG, from what I can tell. 10:51AM – This doesn’t look in-engine, but I guess it’s still early. 10:46AM – The waves look really impressive as it splashes across the ship’s surface. 10:46AM – Ok, we get it. Physics. He keeps chasing after the falling debris! 10:43AM – This is a live demo, folks. 10:42AM – People applaud. They gave them such a tough time, but they were happy when the bass came rumbling in. 10:41AM – Nope. Not that game. Battlefield 4 will be 60fps. 10:41AM – EA and DICE. Here we go Sean! 10:39AM – “The Last Part of the Legend.” I guess this is Geralt’s last game. Environments look fantastic! 10:38AM – Optional voice commands with Kinect. Exclusive to Xbox One. Also, UI and inventory will be on SmartGlass. 10:36AM – SmartGlass interactivity. Calling artillery support via the phone. 10:35AM – Hundreds of weapons with improvised combinations. 10:34AM – That’s definitely a lot of zombies. Ok, I can see how cloud computing can provide “non-essential AI.” I guess to set up background animations and whatnot, it can work. 10:33AM – There were some zombies in the distance that weren’t moving. Power of the cloud? 10:31AM – Dead Rising 3 will be open world, set in the city of Los Perdidos, California. Yes folks, this is a live demo. 10:30AM – Crimson Dragon. Oh, and Dead Rising 3! 10:30AM – People are providing the soundtrack and sound effects of the game. This is hilarious. 10:28AM – Hey Ted, your Microsoft Points are useless now. 10:28AM – Twitch is built into Xbox One. 10:27AM – Upload Studio is where you’ll edit and publish your videos that have been recorded. Also, the video that came after was pre-recorded… he missed that uppercut. 10:21AM – 3 days later? Wow, the last time I spent that much time on a game I was actually playing it. 10:19AM – “Take this rock.” Famous last words. 10:17AM – He’s holding a surface tablet. 10:17AM – Yes. You need magic to make games. 10:15AM -D4, episodic mystery game. Kinect based? 10:11AM – Phil Harrison’s up. 10:10AM – I’ve always liked the Forza series, so this was a no brainer for me if I was picking up the console. 10:07AM – “True innovation is unlocked through its connection to Xbox Live.” Live demo right now. 10:05AM – Forza Motorsport 5 will have the McLaren… and they have the McLaren P1 HERE! 10:05AM – A video about McLaren. 10:04AM – The explosions look like jello explosions. But it looks interesting. 10:03AM – Cloud driven, open world game, shooter. 10:02AM – Sunset Overdrive announced. 10:02AM – Insomniac and Microsoft is working on something together. Hmm. 10:01AM – KILLER INSTINCT! Exclusive to Xbox One. Co-developed by Double Helix and Rare. 10:00AM – It’s definitely a next-gen game. A lot of the post-processing and shaders are sharper than if it was on the Xbox 360. Will be interesting to try out. 9:59AM – Still no Kinect functionality… I guess they ripped it apart and remade it to use the controller? 9:58AM – Frame rate is relatively smooth, until now. The background artwork is making it a little bit choppy. 9:57AM – That’s a lot of QTE’s. 9:54AM – Yup. And look, there’s a live gameplay demo of it. 9:52AM – Uh oh. Phil Spencer. I think I have an idea what he’s gonna talk about. 9:52AM – Yep. It was. 9:51AM – From Software. These aren’t mentioned that they’re exclusive, mind you… just that they’re coming to Xbox 360. Gotta be Dark Souls 2. 9:50AM – I won’t lie. It makes me want to play Limbo. 9:49AM – Two more titles coming for Xbox 360. “Max: The Curse of Brotherhood.” platformer. 9:48AM – 15 on 15 team warfare. 9:45AM – World of Tanks will be exclusive to Xbox 360. Some people thought it was going to be League of Legends. Nope. 9:44AM – Two free games per month for Xbox Live Gold members from July onward, for both new and existing members. Assassin’s Creed 2 and Halo 3 to start. 9:43AM – “We’re gonna update the Xbox 360 console with a modern feel with the Xbox One design.” Starting today. That means the new design is out today. 9:40AM – Showing characters right now. “Quiet, Eli, Kazuhira Miller, Skull Face, Emmerich, Ocelot, Code Talker,” Yep, that was Shalashaska! CONFIRMED! 9:39AM – Yep. 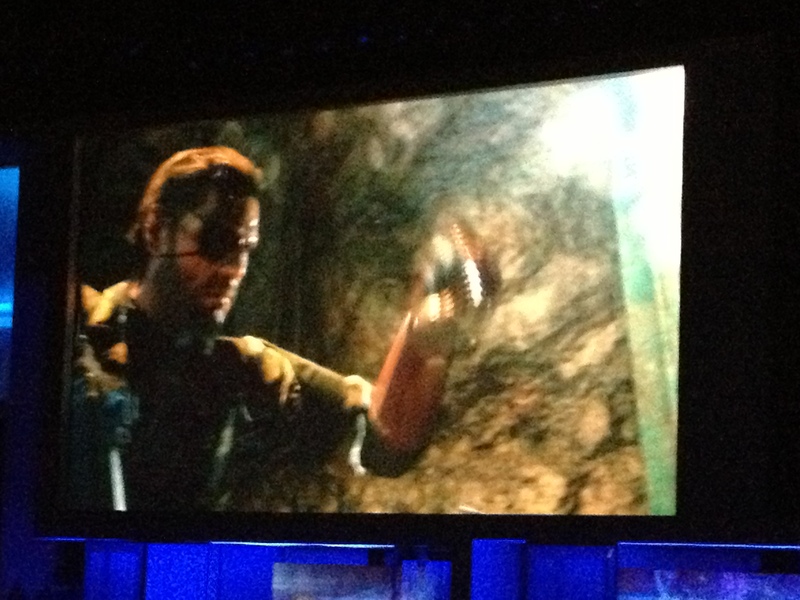 That’s Kiefer as Snake. 9:38AM – This is open world. Shows Snake hiding behind a horse, changing weather in real time. Trailer is fast forwarding through scenes showing off some of the game’s feature sets. Textures look pretty good! 9:37AM – Yep. That’s Snake alright. The question is… is that Shalashaska? 9:35AM – We’re starting! Lights have dimmed. 9:33AM – Nope. Checked a Windows phone… they’re running late. 9:32AM – I guess we’re going by Microsoft time here. It’s 9:32AM on my iPhone, my Macbook Air, and several people’s iPads. 9:30AM – Here we go? 9:25AM – “Ladies and gentlemen. Please take your seats. We’ll begin in 5 minutes.” – Hot sounding announcer lady. 9:23AM – The WiFi is slow as molasses in here. Someone’s probably torrenting something. 9:13AM – Just as a warning, all coverage will be on this page. Instagram and Vine will not be used for the event. 9:11AM – Hello to the people on the website joining us today! It’s going to be… interesting. 9:00AM – Well, it’s 9:00am. I guess we have another 30 minutes? 8:54AM – Met some nice people here covering the event. Sitting down on a sideways position and saw the Doritos ads. Doritos-gate lives! This should be interesting. Bring on the games, Microsoft! My lungs aren’t deep enough for that. Of course they’re starting late. Why not? AT this point. I know. Awesome since I’m keeping my Xbox 360. Nope, the FGC will ignore it. Forza 5 Drivatar concept seems pretty interesting. Project Spark seems like the natural evolution of LBP’s creation system. There you go Ted. Tournament Edition MadCatz Fight Stick at Xbox One launch. New stiiiiiick. Well, it’s official. Xbox Live Gold Sharing and 2 free games per month. That’s more like it. Panzer Dragoon Saga 2 please. That reminds me… still gotta finish up The Witcher 2. Lol… technical hiccups… “It’ll happen, I promise. I’m fine.” lol. Oo… did he say roguelike? That was brief… seems more real time than roguelike. It’s the wanderer! Diablo II2. Mirror’s Edge will be at EA. The wanderer is Master Chief. It all makes sense now. Wow, the Stream I was watching cut out before the price reveal. Titanfall was pretty damned impressive. You probably need some sort of blog app thingy, to make it easier. Anyway my thoughts on the MS conference. It’s definitely better than last years, it got good games and some are exclusive, whether you like it or not. Killer Instinct I think was the most hype for me. Sadly most games It doesn’t interest me. The price going to be a deal breaker for some, DRM problem and price point of $499.99, and how gamers still need to pay for online, that’s hard to shallow. I give it a 6/10. Next is Sony. In the end, I will not get the XBoxOne, anyway, never had an interest as a Sony Guy.